The Sri Lanka Embassy in Cairo organized a tea stall at the Cairo Fair held from 18th to 26th March 2015. This initiative was supported by the Sri Lanka Tea Board. A wide collection of Sri Lankan tea samples from Amazon Trading Pvt. Ltd., Stassen Exports Limited, Tea Tang Pvt. Ltd, Ranfer Teas Pvt. Ltd., and Basilur Tea Pvt. Ltd. were displayed at the stall. Multi-flavoured tea bags packed in gift boxes became attractive and prominent in the display. These kind of value-added tea varieties are popular among high income consumers in Egypt. 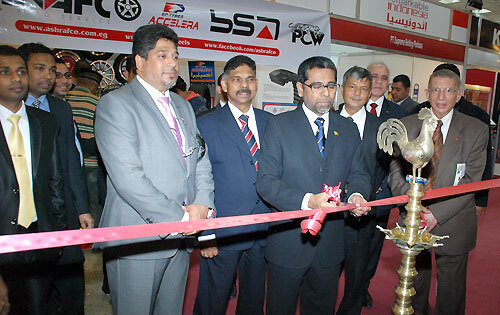 The Egyptian Prime Minister His Excellency Ibrahim Mahlab and His Excellency Monir Fakhry Abd El Nour, Minister of Trade paid a visit to the stall soon after Ambassador Sudantha Ganegama Arachchi inaugurated it on 18th March 2015. The Sri Lanka tea stall was visited by many. One-to-one business meetings with potential buyers gave useful insights for designing future promotion strategies in the Egyptian tea market. The stall was also used as a window for promoting Sri Lankan tourism by distributing tourist promotion materials among visitors. Tea drinking remains part and parcel of Egyptian culture. There is huge market potential for Ceylon tea in Egypt which annually consumes about 100,000 metric tons of tea. This huge market potential deserves the attention of Sri Lankan exporters. The Sri Lanka Embassy remains ready to extend every possible assistance to the interested tea exporters to explore the potential for gaining access to the Egyptian market.